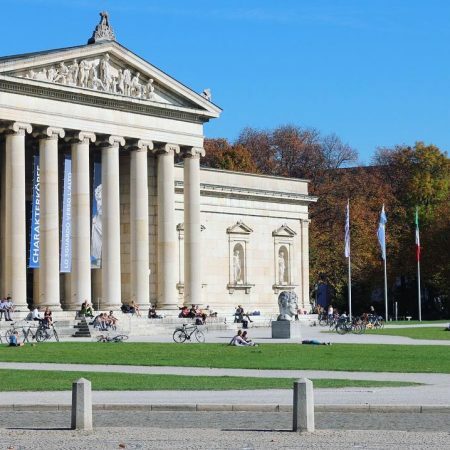 The "Museum Munich - Route" takes us to the Kunstareal, from the Karolinenplatz to the Lenbachhaus, to the Pinakotheken, the Museum Brandhorst, the Museum of Egyptian Art and ends in the student quarter. 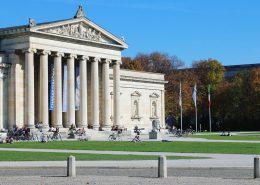 With its numerous sights and collections of art and paintings, the Kunstareal forms the intellectual heart of Munich. At the end of the tour we treat ourselves to a short walk through the lively university quarter. We start our tour on Odeonsplatz. 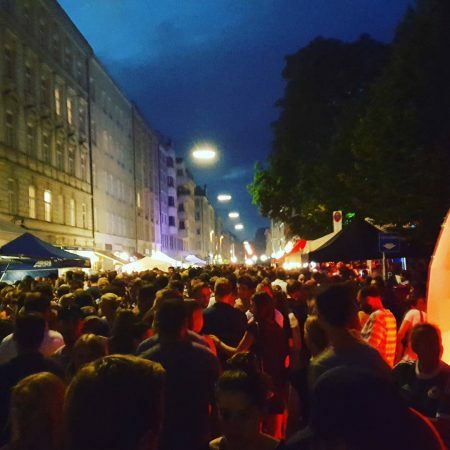 From Odeonsplatz you walk and continue straight through Briennerstrasse. Soon you will recognize the obelisk on Karolinenplatz. On the 18. 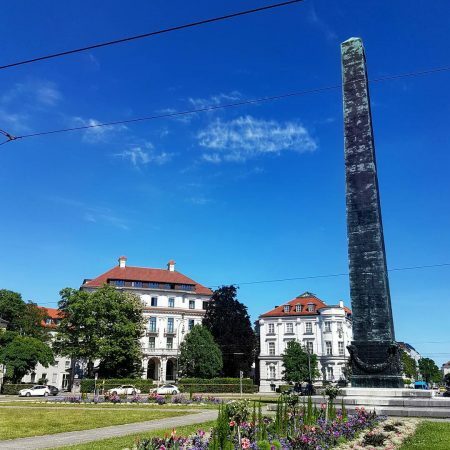 October 1833, the anniversary of the Battle of Leipzig at 1813, the obelisk was unveiled in the middle of the Karolinenplatzes solemnly. Bayern supported the Napoleon opponents Russia, Austria, Prussia, Sweden and England 1812 to1813 with over 30.000 soldiers. The soldiers had to pay loyalty to their lives. The Brienner Straße and the Barer Straße, which cross the square, are named after places of battles of the liberation wars against Napoléon. The Briennerstrasse continues straight ahead, it comes directly to Königsplatz. For me he is one of the most beautiful places in Munich. In fast-forward, it goes through the classic Greek architectural styles. The Propylaea on the west side of the square are decorated in the Doric style. Coming from Karolinenplatz, you can see the mighty gatehouse first. To the right of this we can see the Glyptothek in the Ionian and exactly opposite the collection of Antiquities in Corinthian style. This enthusiasm for Greece is essentially due to the Bavarian prince Otto the First. He was sitting on the Greek throne from 1832 to 1862. Today, the modern lifestyle dominates here - sunbathing, outdoor cinema and numerous concerts characterize the image of the square in the summer months. We go through the archways of the Propyläen and recognize right, a little hidden in the garden, the Lenbachhaus. The Lenbachhaus houses, among other things, the world's largest collection of "Blue Riders". This group of artists included such famous painters as Franz Marc, Wassily Kandinsky, August Macke, Paul Klee or Gabriele Münter. Gabriele Münter left 1957 on her 80. 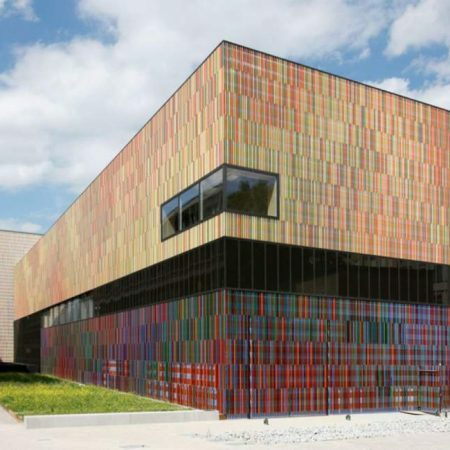 Birthday the Lenbachhaus 25 own paintings, 90 oil paintings of her husband Wassily Kandinsky, about 330 of his watercolors and drawings, his sketchbooks, reverse glass paintings and prints and numerous works on paper. 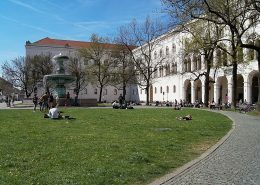 In addition, she bequeathed to the Lenbachhaus works by August Macke and Marianne von Werefkin. 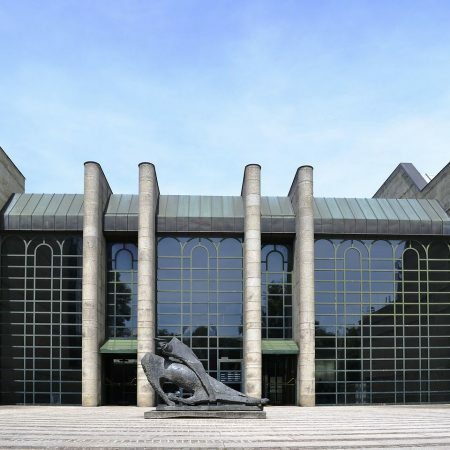 In addition to this magnificent collection, the Lenbachhaus houses the collection "19. Century". Originally, the gallery showed mainly works of Munich painting from the 19. Century and the German art of the early 20. Century. The "New Objectivity" collection is dedicated to art after the First World War. For the painters in the 20er and 30er years, in contrast to the previous expressionism, the sober and realistic representation prevails. We continue straight ahead to Gabelsbergerstrasse, where we turn right. We cross the Arcísstrasse and see the new building of the State Museum of Egyptian Artt. 1.800 square meters show exhibits from almost 5.000 years of Egyptian history. The museum shares the modern building with the College of Film and Television. The exhibition, which for reasons of conservation is located in the basement, is divided into two main sections. The first is dedicated to Egyptian sculptures and presents similar exhibits side by side, regardless of their time of origin. I was most impressed by the 5,80 m high obelisk of Titus Sextius Africanus. The second part of the collection is devoted to the themes of the hereafter faith, religion, writing and text, arts and crafts and ends with art of neighboring regions, Nubia and the Ancient Near East. On the other side of the street you can see the New Pinakothek gallery. Here we find almost 400 works of European art from the late 18., The entire 19. and the beginning of the 20. Century. Thus, the collection spans an arc from the Enlightenment to the modern age. The most famous exhibits are certainly Van Gogh's sunflowers, Spitzwegs Armer Poet, the triumphal procession of Germanicus with impressive 35 square meter canvas and not to mention Louis 1. in full regalia. 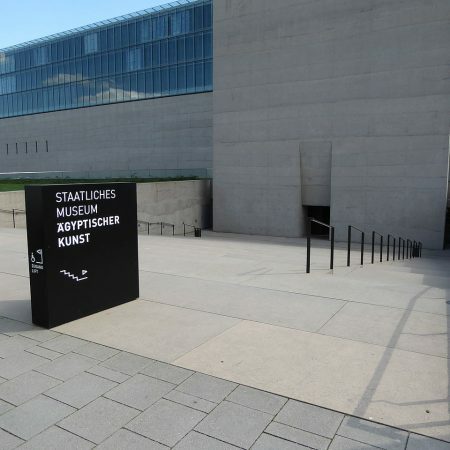 To get to the old Pinakothek, we go back a little to the Arcisstrasse, in which we turn right. After a few meters we pass the main entrance of the Technical University of Munich. It is definitely worth a detour to Café Vorhoelzer. Just enter the university building, follow the signage Forum and take the elevator to the top floor. 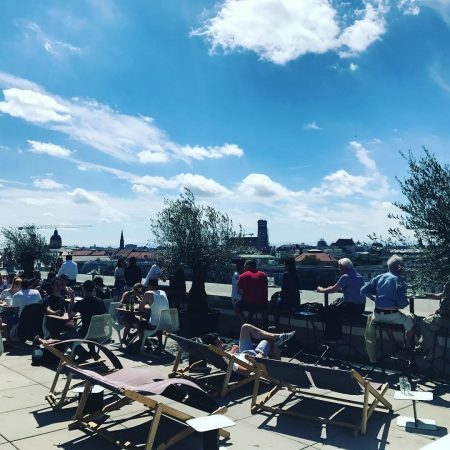 Café Vorhoelzer impresses with its large terrace, which gives us a wonderful view over the rooftops of Munich - and in good weather all the way to the Alps. Although the café is no longer a secret, the international mix of students and tourists has developed its own charm. 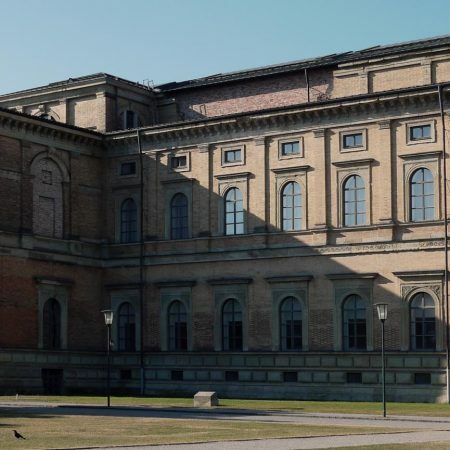 But back to the old Pinakothek, She is one of the most important picture galleries in the world and shows us more than 700 significant works of European painting from the 14. until the 18. Century. Here we find paintings by Dürer, Rembrandt, Altdorfer. Boticelli, da Vinci, Rubens, Titian and Raphael. Between the old and the new Pinakothek we go back to Barerstrasse. Only a few meters to the left and us already falls Pinakothek der Moderne in the eye. 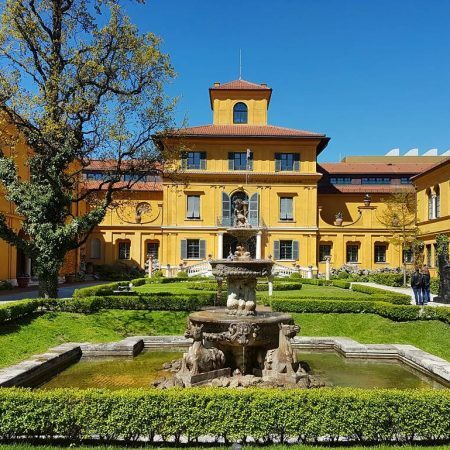 It is one of Munich's biggest attractions and, with its 4 museums and 12.000 square meters of exhibition space, is one of the most famous exhibition halls in the world. We continue on the forecourt of the Pinakothek towards Türkenstrasse. At the end of the square we see to our left the impressive building of the Museum Brandhorst and right in front of us Türkentor. The meeting of the historical building fabric with the round and high-gloss sculpture unfolds its very own aesthetics. 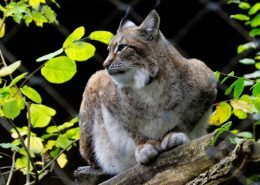 By the way, the visit to the Türkentor is free. Already we are at the last station in the Kunstareal, the Museum Brandhorst, arrived. 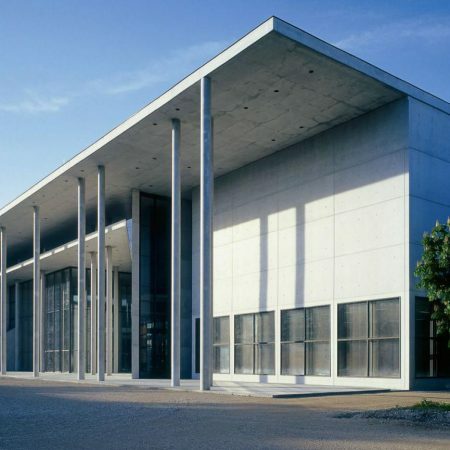 The focal point of the Museum Brandhorst is the work of the American Cy Twombly. His works characterized abstract expressionism. The extensive Cy Twombly collection is considered unique and most significant outside the United States. Together with the Pinakothek der Moderne we find here a comprehensive collection of artists of the 20. and 21. Century. At the end of our tour in the art area we dive a bit into the university district and roam the Theresienstrasse, Turks, Amalien- and Schellingstrasse with its numerous cafes, restaurants and small shops. At the end of Schellingstrasse we see the Ludwigskirche and the subway station "Universität". In the building of the technical university. but the view on the roof terrace is worth it. A popular meeting place in the Türkenstrasse. Great breakfast. Make sure to book on Sundays. If you feel like having the best ice cream in the city, Ballabeni is the place to go. You recognize the small ice kiosk by the long line in front of the door.